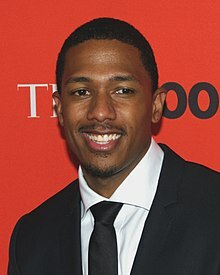 Nicholas Scott "Nick" Cannon (born October 8, 1980) is an American actor, comedian, rapper and radio/television personality. He is known for his roles in Drumline, Love Don't Cost a Thing, and Roll Bounce. He also hosted his own show The Nick Cannon Show. He also hosted America's Got Talent. Cannon was born on October 8, 1980 in San Diego, California. He was raised in San Diego, California and in Charlotte, North Carolina. Cannon married Mariah Carey in April 2008. They have two children. Cannon has lupus nephritis which can cause kidney problems. Carey and Cannon were divorced in 2016. ↑ LeVasseur, Andrea. "Nick Cannon — Biography". Allmovie. Retrieved 2008-12-03. ↑ "Lupus 'attacking my kidneys,' Cannon says". CNN.com. 5 March 2012. Retrieved 5 March 2012. This page was last changed on 28 February 2019, at 22:09.